Cosmetic dentistry is the combination of art and science, a symbiosis only achieved by a dentist with exceptional training, experience, and skill. In addition, an exemplary cosmetic dentist is one who is committed to creating customized treatment plans for each patient and concentrating on the smallest of details, with the goal of achieving the most natural-looking results. Dr. John D. Beckwith is a member of the American Academy of Cosmetic Dentistry, one of the most prestigious organizations in the world. The AACD is known for its rigorous requirements for membership, accepting only the most established cosmetic dentists who have proven their commitment to high standards. Dr. Beckwith has more than 30 years experience in the cosmetic dentistry field, and has obtained more post-graduate education and training than is often required for cosmetic dentists to practice. It is this commitment to learning new techniques and to the advancement of cosmetic dentistry that makes Dr. Beckwith and his professional team at Cornerstone Dental an ideal choice. With cosmetic dentistry, you can enhance the appearance of your teeth and address a number of dental issues that may be causing you to feel self-conscious about your appearance. Cornerstone Dental offers a full range of treatment options, from porcelain dental veneers and professional teeth whitening to tooth-colored fillings and cosmetic dental bonding. Our commitment is to offer you first-class cosmetic dentistry treatment in a comfortable environment, with results that look natural and beautiful. Read on for more detailed information about some of the cosmetic dentistry treatments we offer at Cornerstone Dental, and please contact our practice with any questions you may have. Aesthetic dental imperfections such as chips, gaps, discolorations, and even misalignments can be beautifully restored with porcelain dental veneers. These thin sheaths of highly durable ceramic material are custom-made and color-tinted to blend in with your surrounding teeth, giving them an appearance that looks natural with results that can last for decades. Dr. John D. Beckwith offers the most advanced dental veneer technology available, and can provide patients with exceptionally durable restorations. Professional teeth whitening procedures can effectively lighten the shade of your teeth with long-lasting results. Dr. Beckwith and his team at Cornerstone Dental use Zoom® teeth whitening, one of the most popular in-office whitening procedures. The combination of Zoom® and the high standards of our dental team can lead to a beautiful, bright new smile that will make a terrific impression on others. Porcelain dental crowns are durable coverings designed to add support and improve the appearance of teeth weakened by cavities, decay, or other structural damage. This dental treatment works to preserve as much of the natural tooth as possible and is often used after root canals. 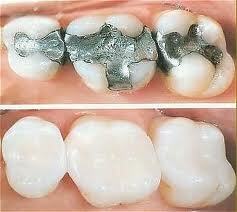 With proper care, the strong porcelain material utilized to construct crowns can often last decades. At Cornerstone Dental, porcelain crowns are custom-designed by Dr. Beckwith, created in an advanced dental laboratory, shaded to match your natural tooth color, and attached with a strong cement for a comfortable fit that blends with your surrounding teeth. Learn more about porcelain dental crowns. Patients who have a missing tooth or multiple missing adjacent teeth can successfully improve their smile with a dental bridge. Dental bridges are custom-designed for a comfortable fit and natural appearance. In addition, a dental bridge can restore lost function, improving a patient’s ability to chew or speak like normal. By eliminating a gap in the smile, patients can also reduce the risk of gum disease, improve occlusion, and prevent unwanted shifts in the bone structure of the face. Some patients who do not have sufficient bone density for dental implants choose a dental bridge as an effective alternative. Dental bridges are crafted from a strong porcelain-based material and can be made to blend in seamlessly with your natural teeth. Unlike a removable denture, a dental bridge is permanently fixed in place for increased stability and durability. To fasten and support the dental bridge in place, porcelain crowns are attached to the teeth on either side of the gap. This procedure can typically be completed in two office visits. Cosmetic bonding is a procedure designed to restore, repair, and enhance teeth that display signs of damage. Teeth that are affected by gaps, chips, discolorations, small cracks, or a worn-down appearance can be effectively renewed with cosmetic bonding treatment. The strong resin materials used in cosmetic bonding procedures provide a durable support structure for the affected tooth in addition to long-lasting results. Up until the last several years, teeth affected by cavities and decay were typically treated with mercury (amalgam) fillings – leaving a noticeable metal appearance to the teeth. At Cornerstone Dental, we utilize what’s known as composite, or tooth-colored materials in all of our fillings procedures. Tooth-colored fillings are completely mercury-free, and once the filling has been applied to the tooth, it is virtually unnoticeable. These treatments allow you to strengthen the affected teeth, reduce the risk of developing further damage, and obtain an aesthetically-pleasing filling. Plus, tooth-colored fillings are eco-friendly, eliminating the risk that mercury can pose on your health and our environment. A smile makeover can address a number of cosmetic concerns in one customized treatment plan. By combining multiple solutions, you can transform your smile appearance by addressing a variety of perceived imperfections to achieve the best possible outcome. For patients who would like to enhance the look of their teeth, Dr. Beckwith offers a variety of cosmetic dental treatments, including teeth whitening, porcelain veneers, Invisalign®, and dental implants. Depending on your needs and aesthetic goals, Dr. Beckwith will recommend the most beneficial and conservative combination of treatments for your smile makeover. Learn more about smile makeovers. If you would like more information on our cosmetic dentistry procedures, or if you would like to schedule an appointment with one of our experienced dentists, please contact Cornerstone Dental today.